MI CASA (Mentors Initiating Community Action, Support, and Advocacy) mentoring project at the University of North Carolina Wilmington is an innovative program designed to provide access to higher education to Hispanic/Latino high school students in North Carolina. 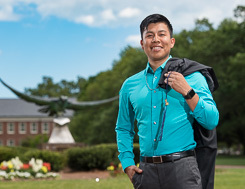 The goal of this two year program is to identify high achieving Hispanic students from local high schools who wish to further their education in universities like UNCW. During this college preparatory process, high school mentees and UNCW mentors foster a stronger sense of community. MI CASA`s mentoring project also involves UNCW faculty members, as well as graduate and undergraduate scholars. The program is designed to encourage the highest level of education for selected Hispanic high school sophomores who demonstrate promise, determination, discipline, and need. MI CASA serves as a comprehensive support program that provides mentoring, college preparation seminars, tutoring, community service, and cultural enrichment activities in order to help high school mentees become compelling candidates for college admission and scholarship awards.